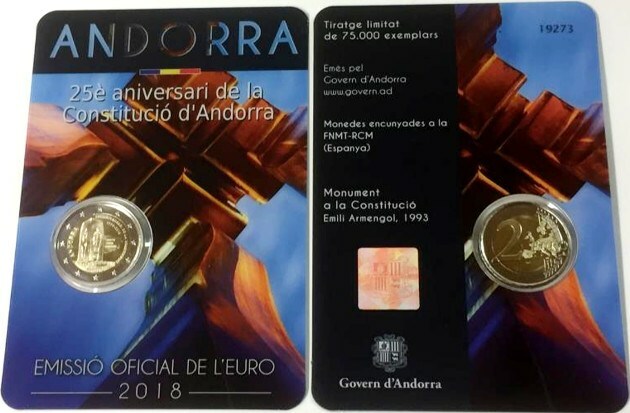 Surely you all know the reason for the first commemorative 2 euro coin that Andorra issues in this 2018 dedicated to the "25th Anniversary of the Constitution of Andorra", by the way tomorrow, Tuesday, March 13 is the day it goes on sale officially the 75,000 pieces of which the issue consists. 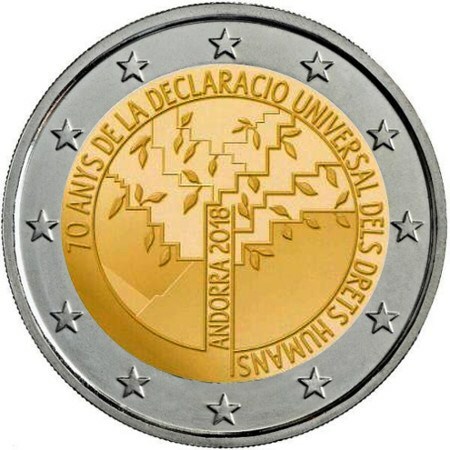 The second coin of this type will be released in the second half of this year, with an identical issue volume, 75,000 units, will be dedicated to the «70 years of the Declaration of Human Rights». Apart from these coins of 2 euros, tomorrow also put on sale two coins of collection dedicated to the Anniversary of the Constitution of Andorra, one of 50 euros face value in gold and the other 5 euros in silver. It also announces the issuance of a portfolio or euroset with the eight regular circulation values ​​with a date of 2018, of which 20,000 units will be put on sale, probably coinciding with the issuance of the second commemorative 2-euro coin.